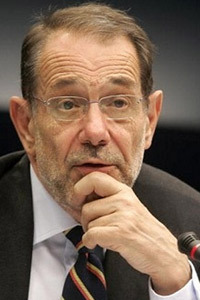 Javier Solana is the former secretary general of NATO, European Union high representative for common foreign and security policy and secretary-general of the Council of the European Union. Solana began his long career in public service when he was elected to the Spanish Parliament in 1982. He held a number of portfolios over the 13 years he served in the Spanish cabinet, including minister of culture and minister of education and science. In July 1992, he became Spain’s minister of foreign affairs, a post he held until December 1995, when he became NATO secretary general. At NATO, he is credited with bringing much-needed re-organization and revitalization to the organization’s military structure. In October 1999, Solana left NATO to become the secretary-general of the Council of the European Union and its first high representative for the common foreign and security policy. His primary task was to put forth ideas and analyze policy options in an effort to help EU leaders agree on foreign and security policy issues, thereby giving the Union more political weight in international affairs. He also assumed a leadership role in world affairs as the EU’s de facto foreign minister. Solana spent six years as a Fulbright Scholar in the United States and received his Ph.D. in physics from the University of Virginia. He is also distinguished senior fellow in Foreign Policy at Brookings Institution, chairman of the Aspen Institute España, honorary president of the Centre for Human Dialogue (Geneva), member of the board of the International Crisis Group, the European Council on Foreign Relations, and Human Rights Watch, as well as senior visiting professor at the London School of Economics, where he was awarded an Honorary Degree in December 2010.